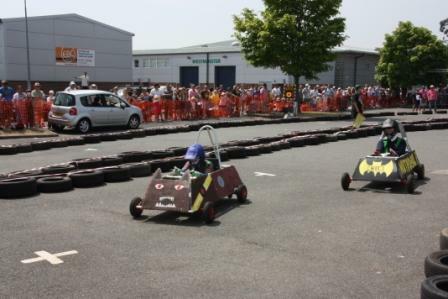 July 2013, a deserted industrial estate on Sunday was the venue for the ‘Uckfield Kit Car Grand Prix’, organised jointly by RC Uckfield and the Uckfield Community Technology College. 22 teams took part in their ‘Goblin’ electric karts which they had assembled and decorated themselves..Special thanks to Rotarian Rory O’Connor, wh is also a senior teacher at the college. Helped by excellent weather (which we usually have in Sussex in the summer – Ed’s. 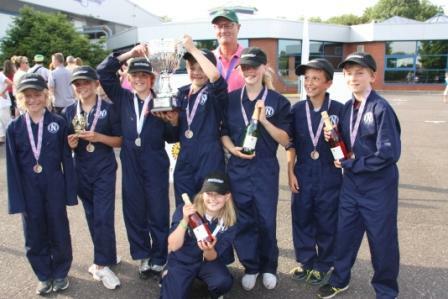 Note) all twenty two teams completed in a ‘Concours d’elegance’ then heats and finals. Winners were the Uck C of E Primary School, who clearly had Jesus running as co-pilot. Picture at foot of them as winning team, nice to see a balanced team of 4 boys and 4 girls. A good time was clearly had by all!